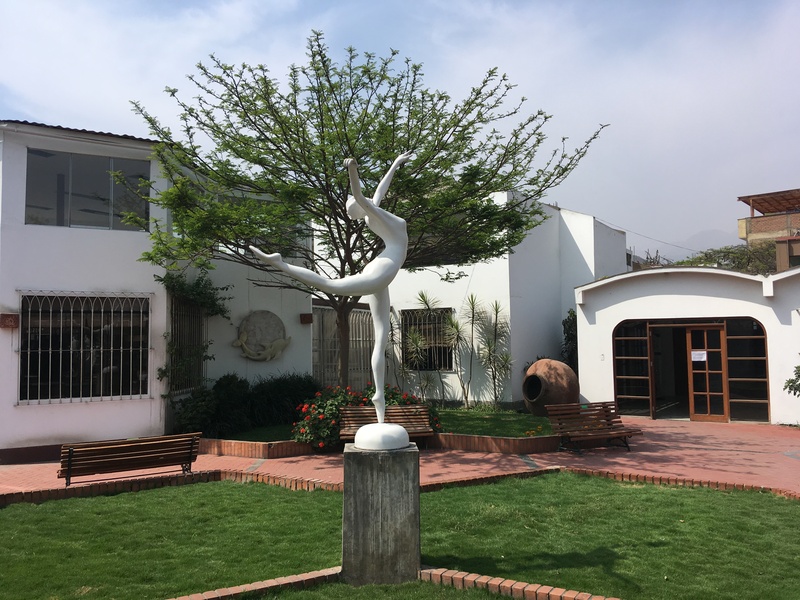 We stepped off the bus from Paracas and I was whisked off to sample the delights of Gaia Holistic Centre in Lima. Vegetarian and vegan menu and wellness centre. Oh joy. A spa with food. Yes two of my favourite things. 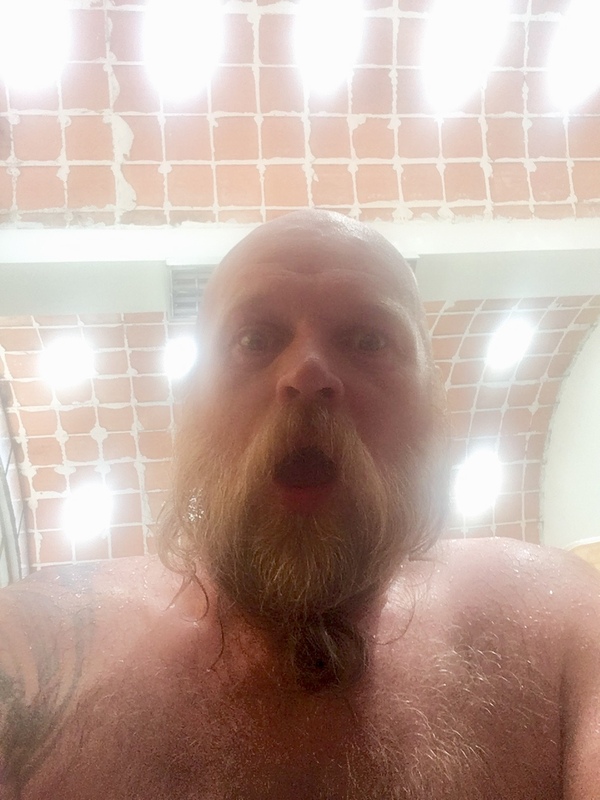 After a delicious vegan milk drinks of nuts and pineapple I was whisked away to the hydro-thermal baths to have more temperature raised to near fever level to trigger my immune system. My body temperature tends to sit one degree lower than average and as a child when my temperature reached ‘normal’ I would have convulsions. So this wonderful cure I was about to take did at first concern me a little. Then I remembered the many many times I’ve spent in gay saunas getting over heated and decided that all would be fine. Beside the last convulsion I had was aged 7. Stripped naked I stepped into a warm bath that was slowly made hotter in stages. A vast amount of herb infused sea salts were added and I soaked in the heat and minerals. My temperature was taken and once it had passed fever point I knelt as instructed to and buckets of cold water were poured over me. Then I was mummified in linen and white towels with just my head sticking out. My head was then wrapped in ice cold towels to bring the body temperature back to normal. This treatment triggers the immune system. The icy head wraps are changed regularly. I just couldn’t seem to stop sweating. 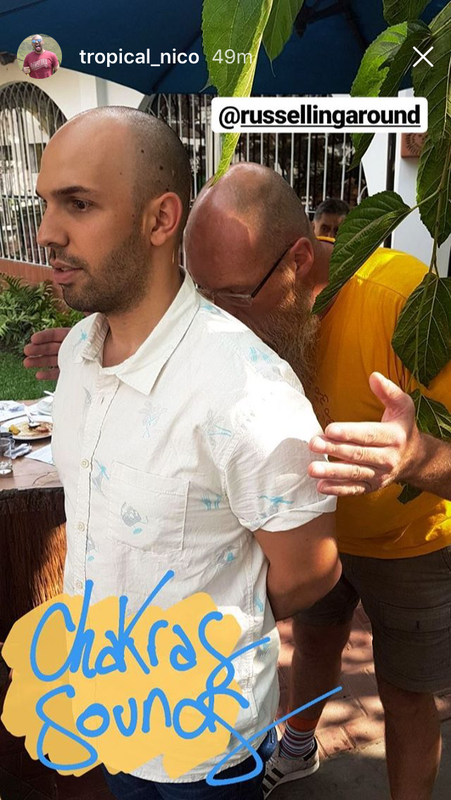 I demonstrated some sound healing on my lunch guests who included tropical_nico a travel influencer from Colombia who was here to sample Gaia too. He posted this on his Instagram feed. The treatment and the healing left me super starving and luckily a feast arrived. 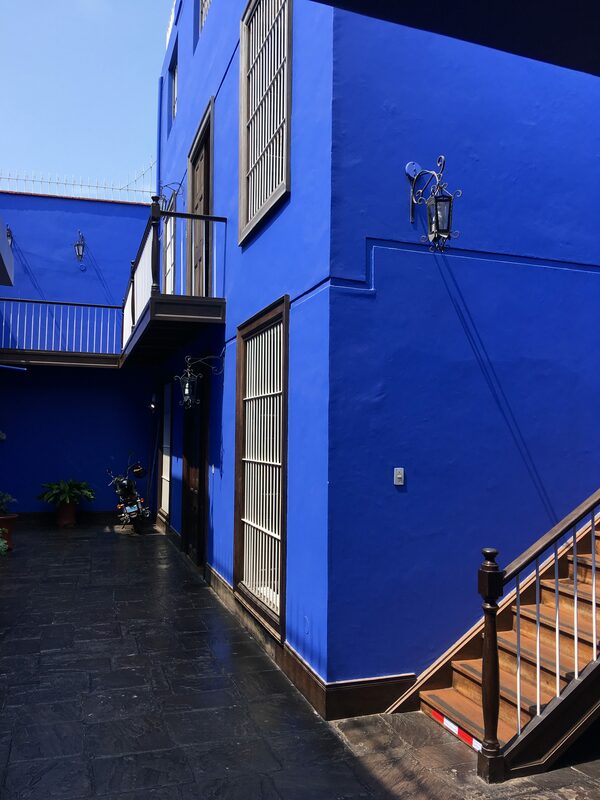 We had such a delicious lunch, free from the carnal obsessions that dining in Perú brings that later when I was left fantasising that I’d managed to get stuck in Gaia and forced to eat more healthy beautiful food. Unfortunately I needed to get back to Olga’s house as were and a flight to catch. 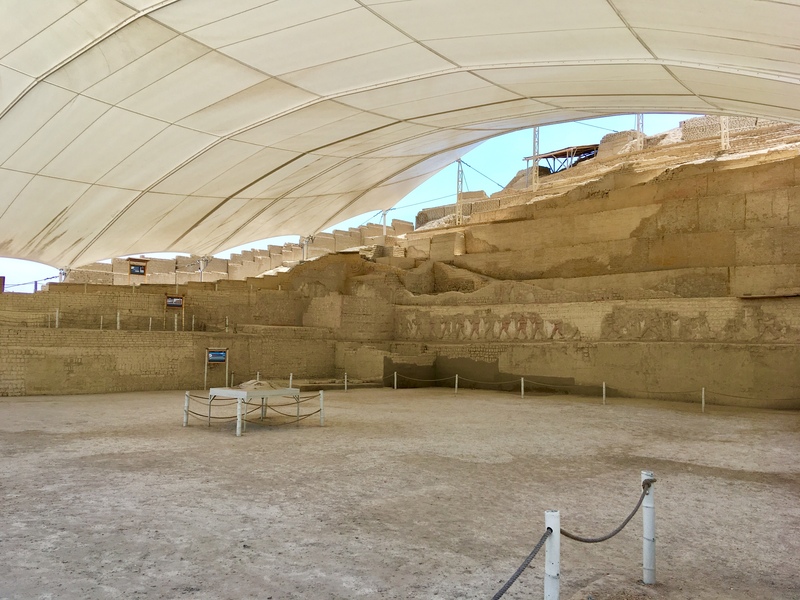 We headed north on a plane to the city of Trujillo so that I might begin to appreciate and understand how pre-Colombian Perú is about much more than just the Inca culture. The Incas were in fact the last in a long line of different cultures and civilisations stretching back thousands of years. 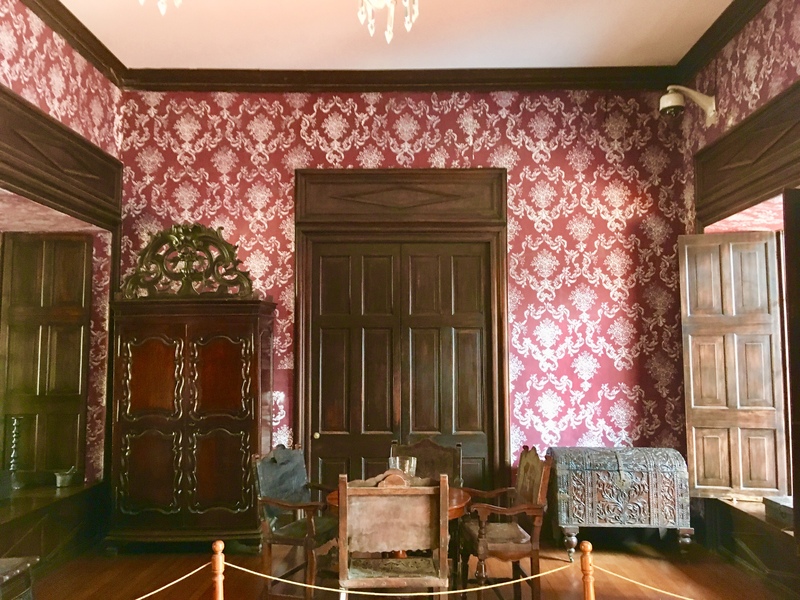 We began in the Plaza Mayor and a visit to La Case Urquiaga museum where we saw the wonderful interiors of a Republican period house and the rich colours of the period and fabric wallpapers. 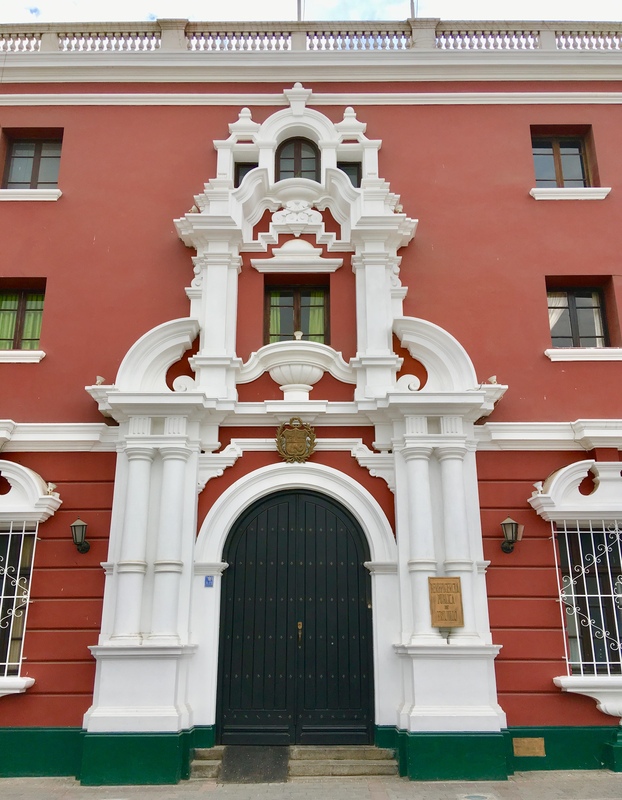 Built in the 16th century and now belonging to the Banco Central de Reserva it was the home of Simon Bolivar from 1824 and was the place in which he planned the emancipation campaign for Perú. The Bank bought the house in 1972 and restored it. 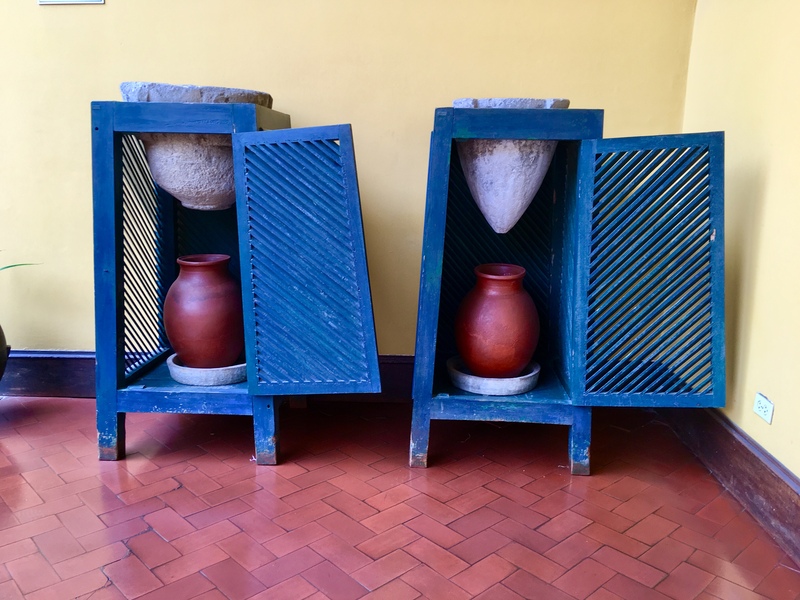 In a corner of the courtyard we found a early filtration system for cleaning water to drink. Water is poured into the stone above and drips slowly into the ceramic jar below. 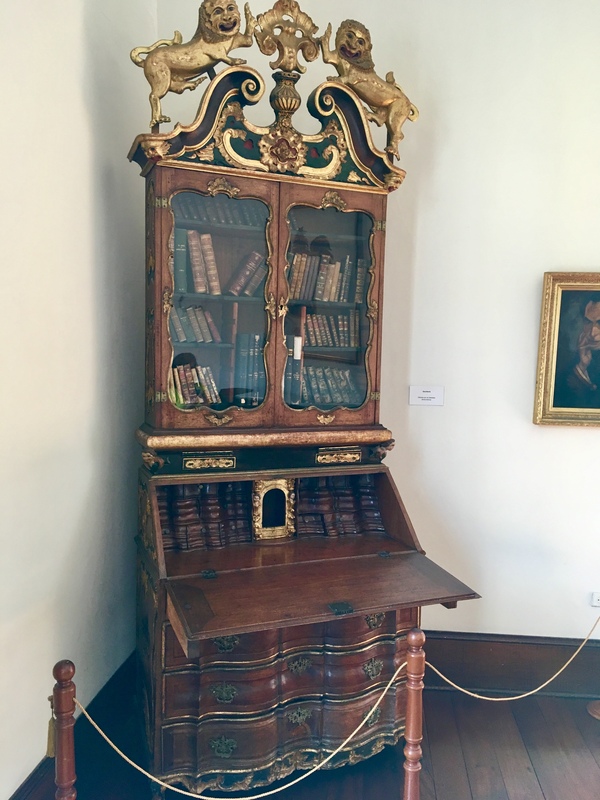 We also got to see Simon Bolivar’s writing desk and a portrait of José Faustino Sánchez Carrión and his amazing eyes painted by Etna Velarde. 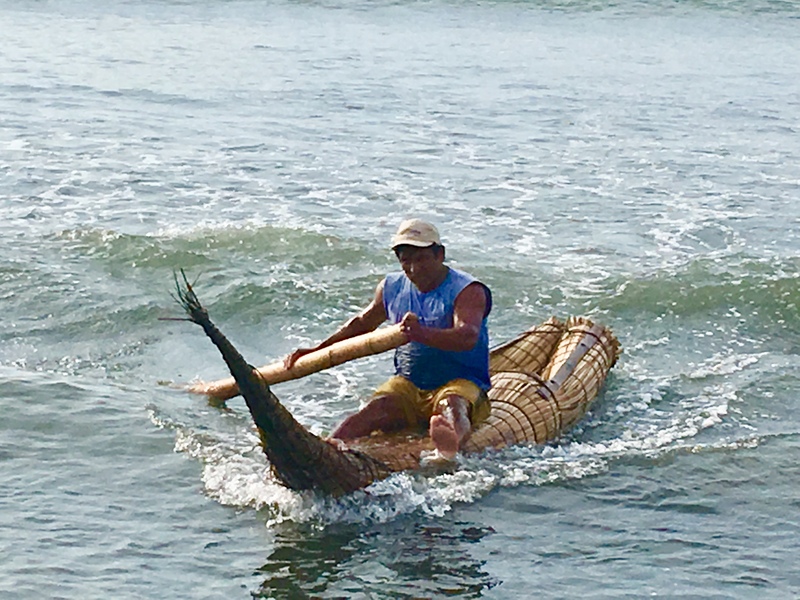 On our journey north to Cao we learned all about sugar cane and reeds used to create ancient fishing vessels still built the same today. All along the coast there once existed dry forests teeming with life. Clever plants and trees drew water up from the ground to create waterholes. The early civilisations also became experts in channeling water from the mountains to irrigate extra land for growing crops to feed their flourishing populations. When the Spanish conquistadors rocked up in their ships to take possession of South America they came in search of gold and to set up the mining all over becoming a powerful Empire which the English set about robbing from their treasure laden ships as they sailed back to Spain. We called them Privateers not Pirates as they were stealing for the state coffers. Once the Rupublic of Perú was declared and founded they needed every square inch of fertile land to make money. So the dry forests, that existed all over the coastal desert region were cleared to make more room for sugar cane which still covers acres of land around. 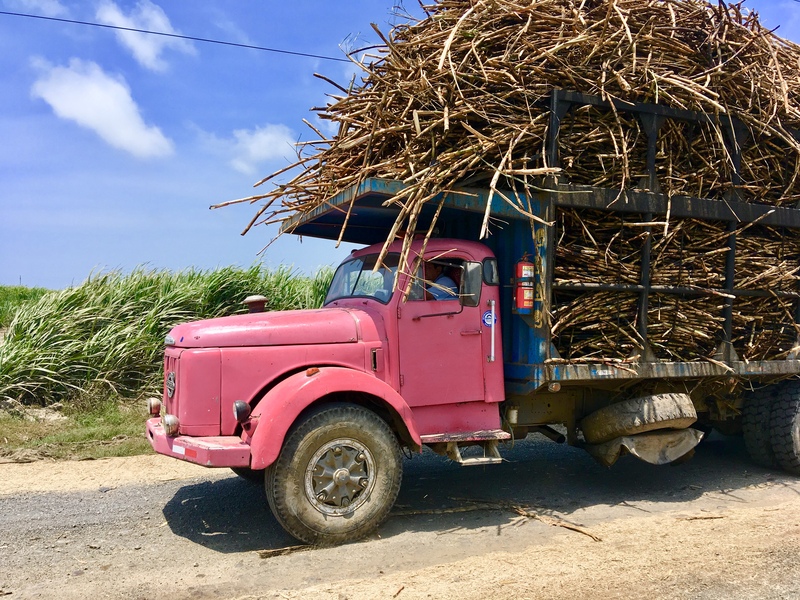 The cane grown here is still used to make Pomalca rum named after the Hacienda that grew the cane and the scent of sugar In the air is quite strong and heady. The canes grow to about 2m and it is only when it flowers that it is ready to harvest. Part of the crop is taken away to be sold locally and eaten raw or the canes are freshly juiced. Much is sent to be refined into crystals or sent to make rum. 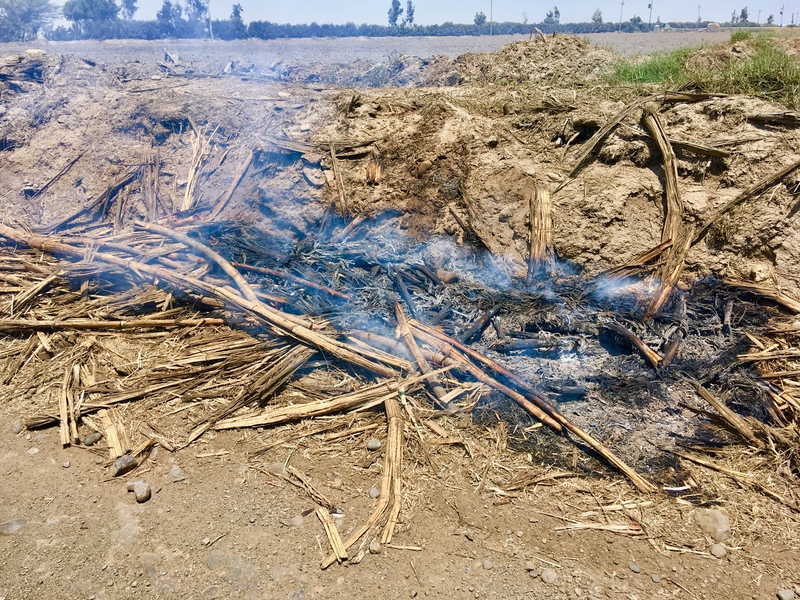 Some of the canes are burned in the fields to create a natural potash to go back into the ground. 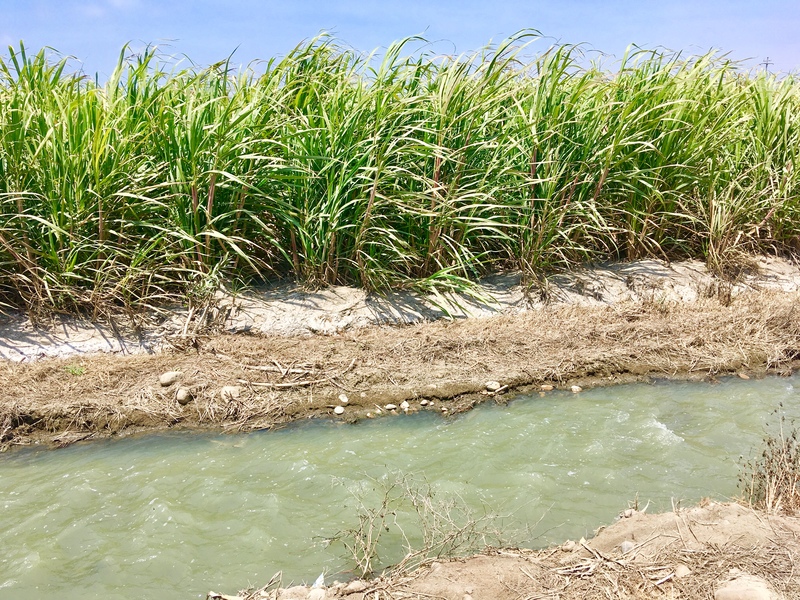 Channels of fermented water encircle the fields to stimulate sufficient growth of quality thick canes. 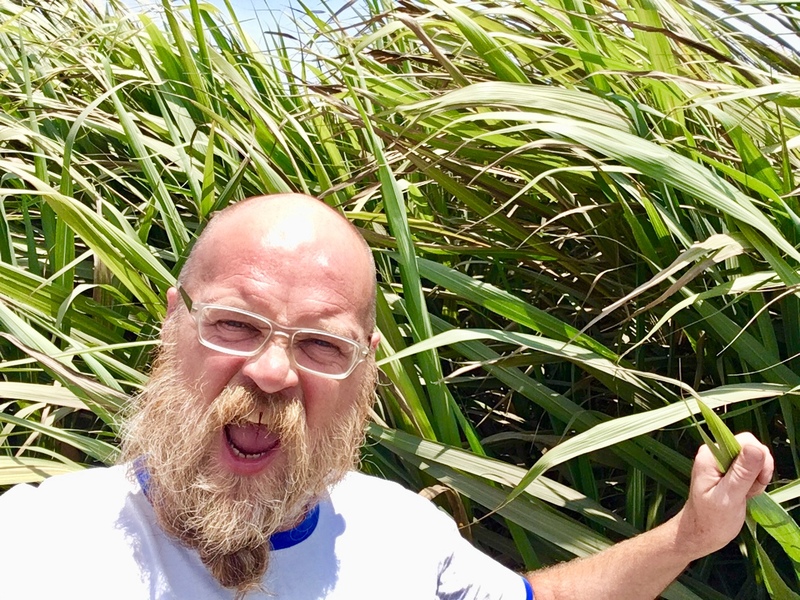 I just loved the sweet air and the molasses tasting smoke that danced on the ocean breezes as fields were scorched to be rested for a few months before new canes are planted. My pre-Columbian education began with a trip into one of the most groundbreaking discoveries here in recent years. 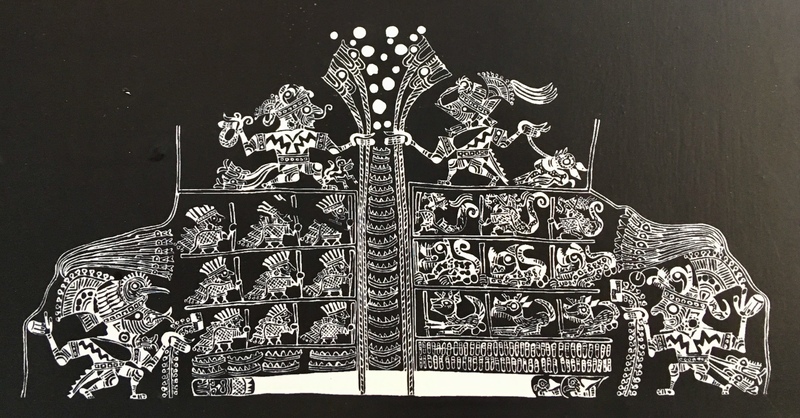 So surprising that scholars and archaeologists were all sent back to the drawing board to begin a new appreciation of the Moche people who lived in the region from around 100 – 700 CE. 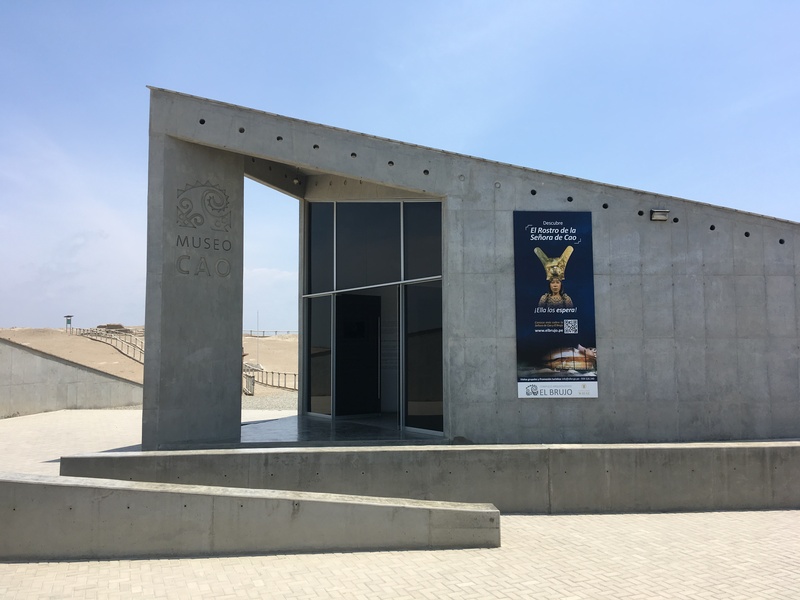 This is the private Museo Cao funded by donated money and not state run. 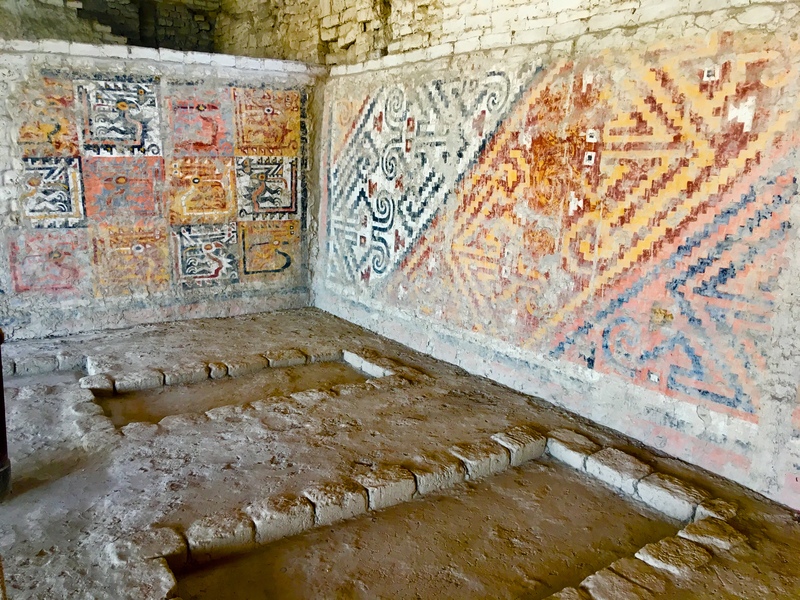 Many people question the wisdom of building such a visible modern structure on the very landscape known by the Moche people and right between two Huachas. 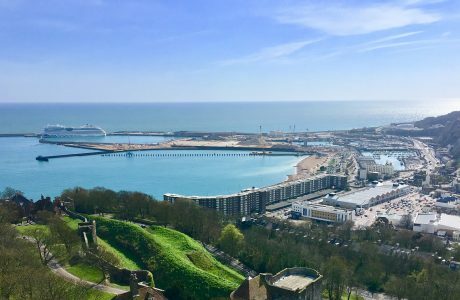 Could the museum no have been built underground with a less intrusive footprint on the landscape? I don’t have the answers. Maybe it was the expense of digging. I worry even with this museum that during El Niño years the tide could sweep in or a tsunami might engulf it after an earthquake. Introducing the fabulous and totally entrancing tattooed Lady of Cao. 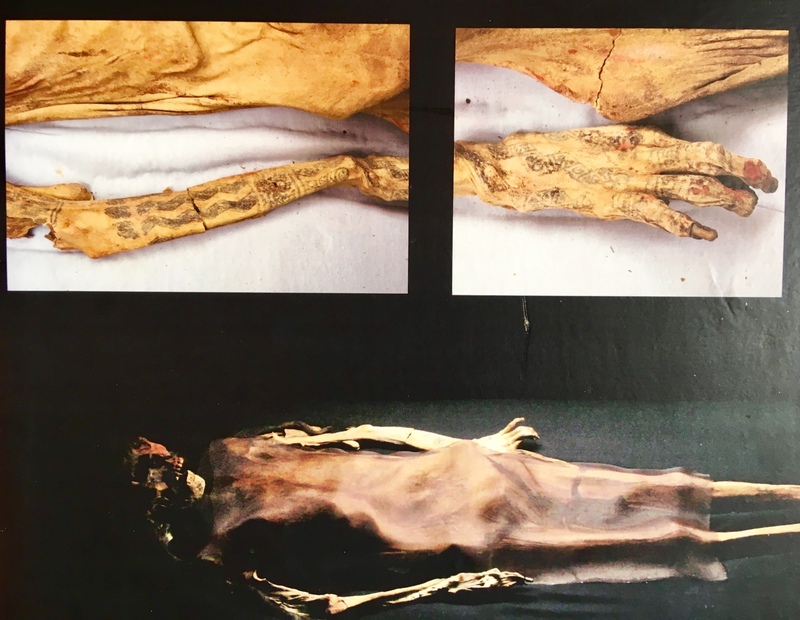 The discovery of her tomb along with her entourage and all its treasures pointed to a woman of such importance that she was possibly a Cleopatra or Boudicca of South America. High priestess, ruler, queen or Sybil or all these things is what the archaeologists currently believe. There is much division between the various scholarly theories as most Peruvian civilisations had no written language. They did however leave pottery covered in images of daily life and things important to them. These stories in the round are a remarkable record but it should also be said that they, could also be a form of propaganda by ruling elites. Or indeed merely decorative trends. 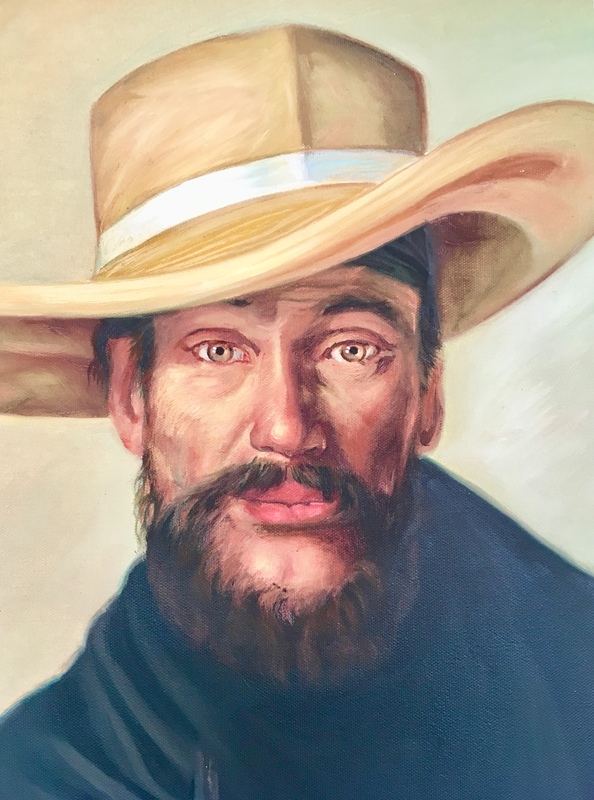 Making assumptions is the dangerous slippery slope and as we toured the museums we began to learn that the best museum curators are those willing to admit that everything is assumption. Often too the interpretation is heavily biased by Christian morality. Creatures depicted in rituals are said to be female healers in one museum and then males in ritual masks and costumes in another. 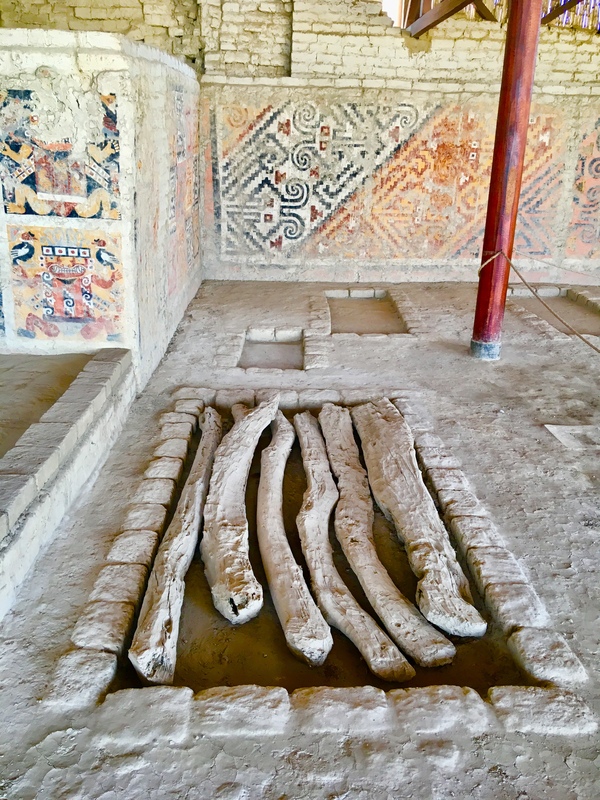 The problem with the archeology in Perú is that the colonials robbed tombs for their gold and rumours of modern thefts by locals, who live around the ruins and unscrupulous archaeologists suppling the black market are told by so many people here that the truth is harder to unravel as many pieces are missing. 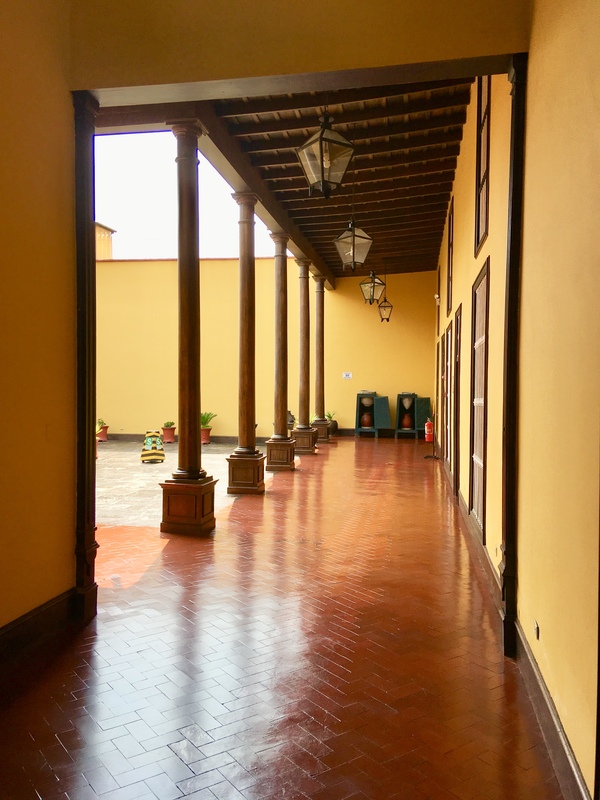 In Perú they still ban cameras entirely from inside most museums which is a real shame in the age of social media. I would share more pictures on social media to encourage others to visit but they don’t seem to want increased visitor numbers. 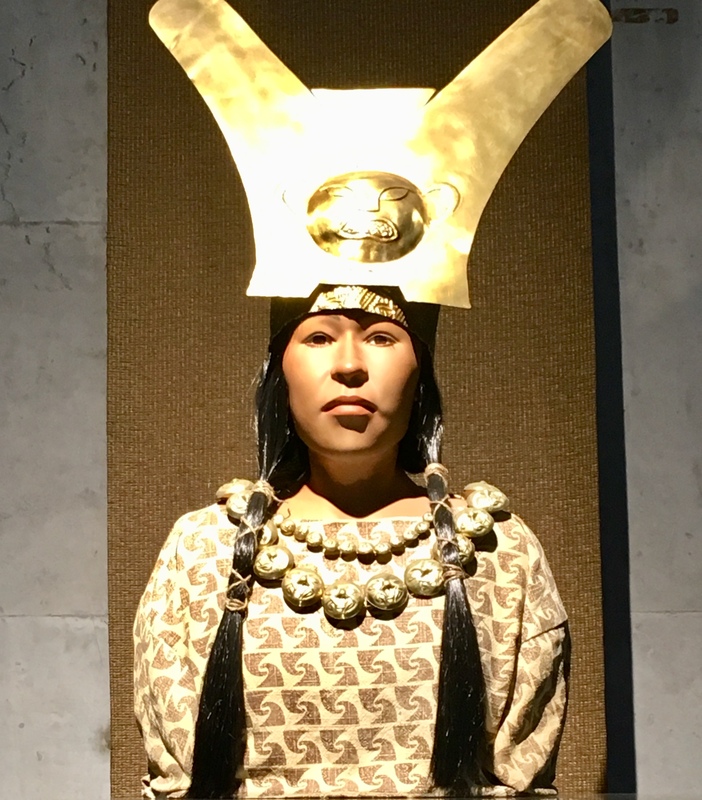 At the end of the gallery they have a reconstruction of the face of the lady of Cao based on the faces of local women. The characteristic almond shaped eyes is very widely seen here in Perú. What the Lady of Cao reveals is that the previous assumption that these were male dominated societies full of warriors and human sacrifice is not the entire truth. Even at Cao she is seen as an oddity. A one off female ruler. Even though in San José de Moro they have since discovered eight more females of high status attributed to being priestesses. 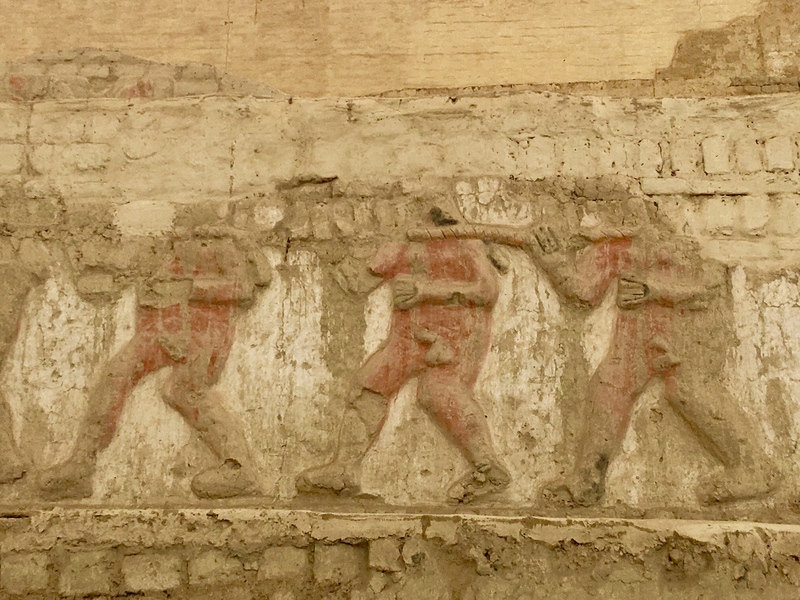 Here at Cao were told that each successive layer or step up the temple was a new temple built by different dynasties at differ points in Moche history. Each dynasty built a larger temple and filled in the entire level of the previous temple. This might be true but it also might be that they needed more space as the population grew. Luckily for us this helped to preserve the carvings and painted walls. 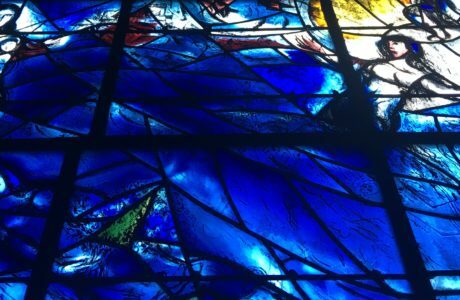 Or it might have been the case that during El Niño years or after earthquakes the people felt a greater need to appease their gods and so set about creating a new fresh space in which to worship their gods. 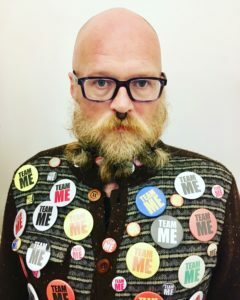 I began to develop more and more ideas and theories of my own as I gathered more strolled around gathering ideas and data from different sites. In my version of Moche life and times I began with a desire to show that human sacrifice was not a violent act on its own people necessarily but perhaps a rite of passage performed while intoxicated on the mescaline family cactus San Pedro or echinopsis pachanoi known by locals as Wachuma. But it slowly developed in many more creative ways about life with a totally different morality to our own and with all the penises on show carved into the walls I began to wonder just what the hell had been going on here. 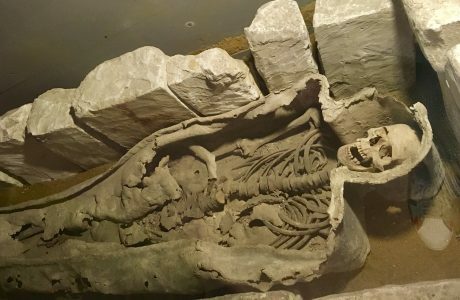 I know damaged skeletons were found in pits and bones reveal flesh having been cut off but I wanted a less cruel explanation. 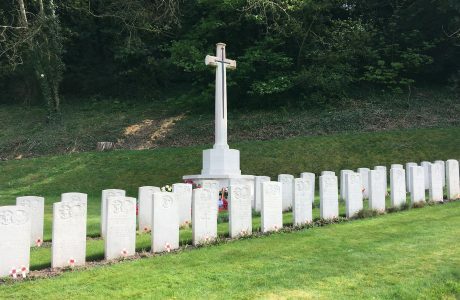 Either prisoners were sacrificed after hunting them for sport or the hallucinations rituals called for some kind of trial or test that many failed at and were murdered or committed suicide through shame. I just felt the guides were saying look at the terrible things they did. Lucky for them Christianity came along and acted fairly to bring about a less cruel world. 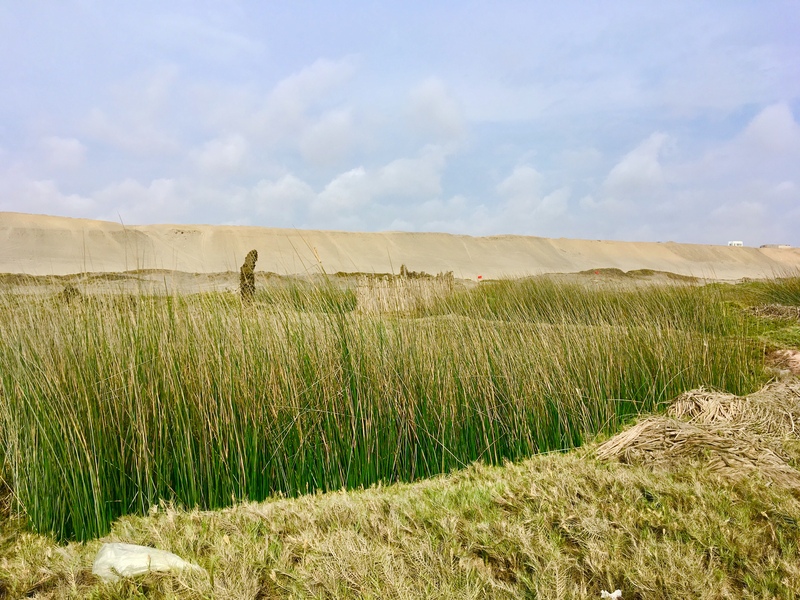 On the drive up to Cao we had stopped to see how reeds are grown and dried all along the coastline here. 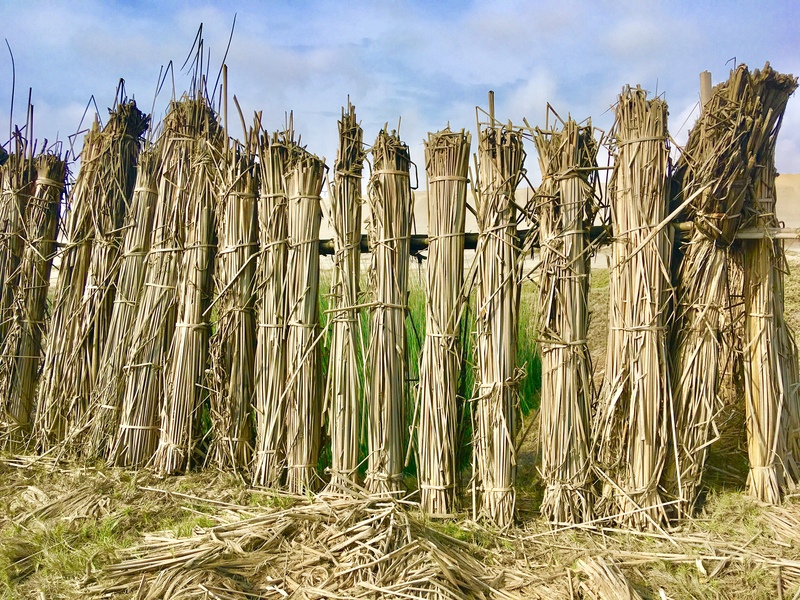 These reeds are used to create a special reed boat. Reed boats have been made here for fishing for thousands of years. 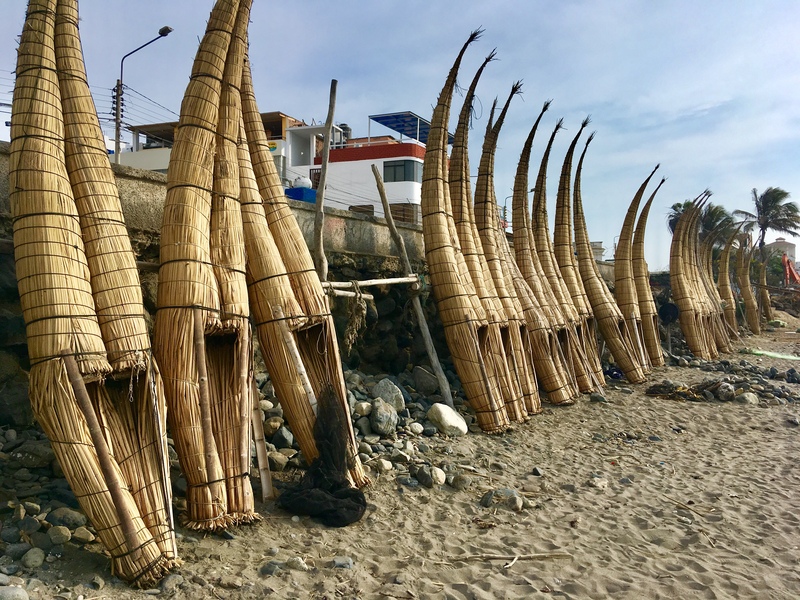 Some locals believe their Polynesian ancestors arrived in Perú on these very boats. I love the romance of origin stories. 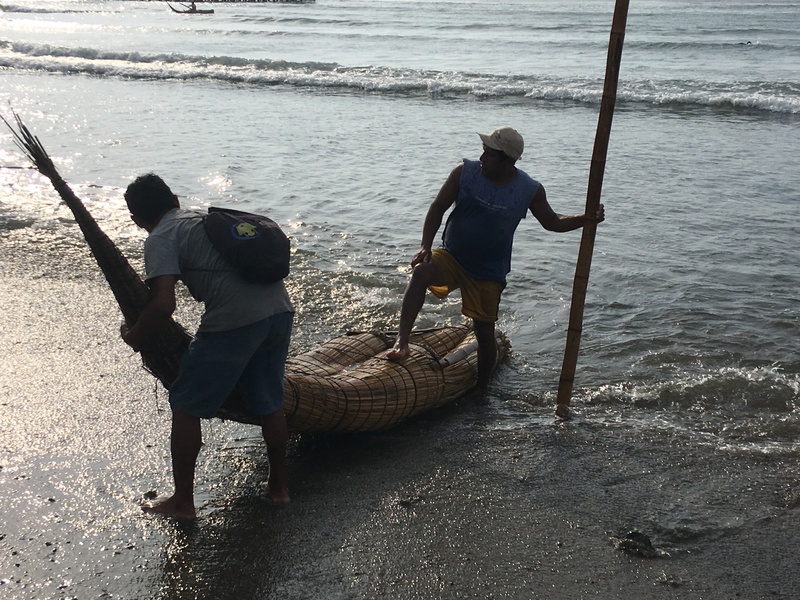 But these boats, Caballitos de Totora do have an origin story that is the most wonderful and amazing tale. 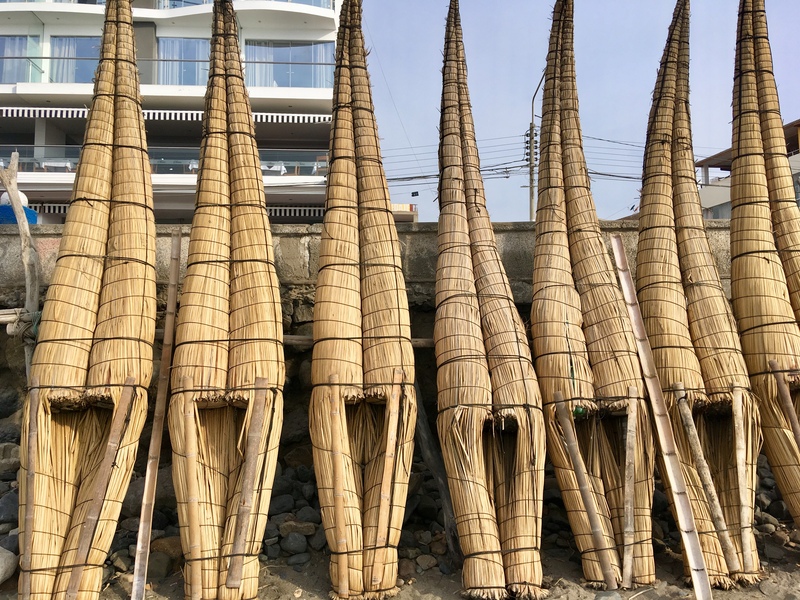 Along the ocean shore of Huanchaco on a very busy stretch of beach there stands long rows of these reed boats that look like giant Arabian curved shoes. Like a shoe rack for giant Amazon warriors. Here I see guys seated straddling the boats and paddling in the ocean. They look so elegant. 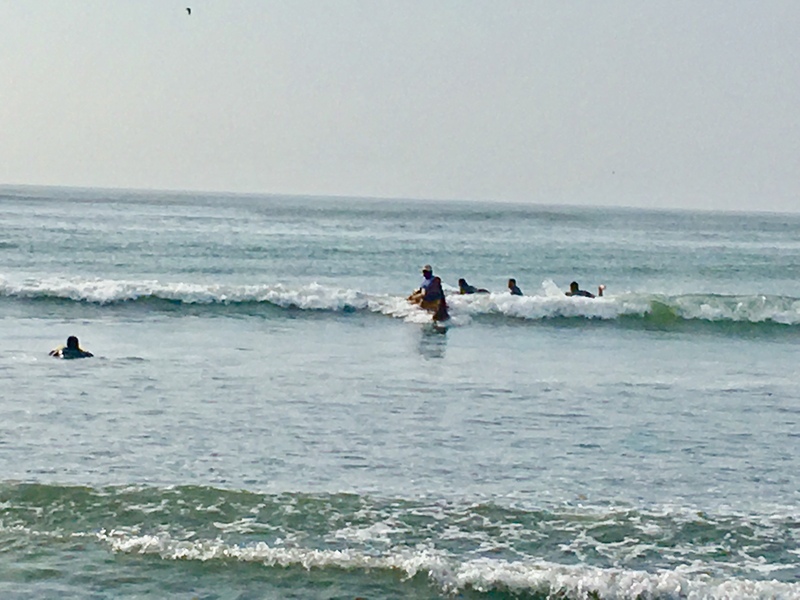 However some fishermen began to stand as they rode the waves home. This my friends was the birth of the surf! 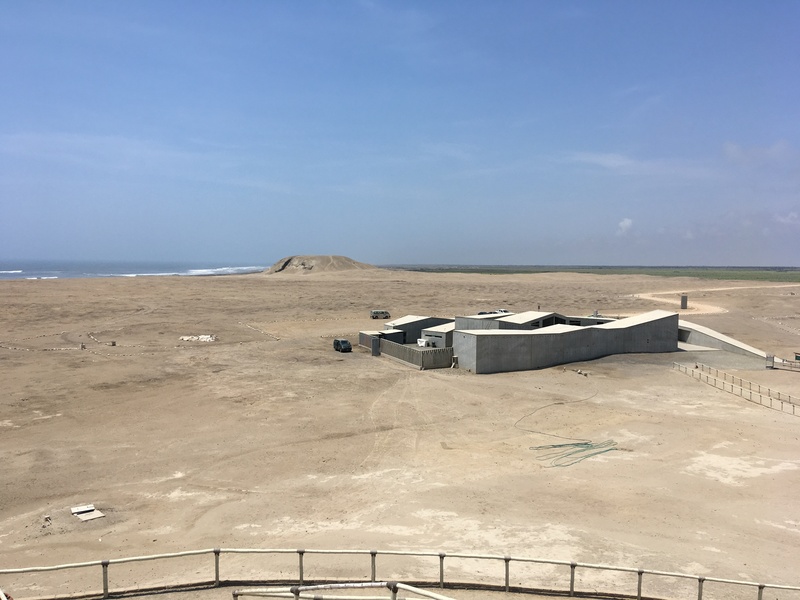 And further up the coast of Perú is the longest left breaking wave in the world measuring 2.2km at Puerto Chicama. These dudes were born to surf. 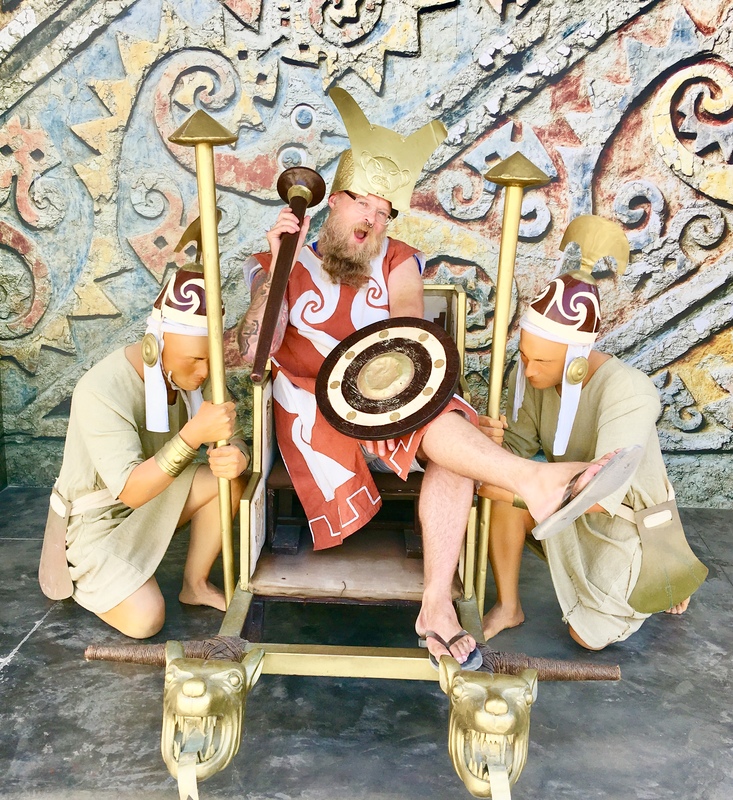 After a day learning about the Moche and the wondrously mystical Lady of Cao there really was only one thing left to do… dress up as her. It’s almost impossible to get your hands on a nose plate round these parts mind!